Chicago's James Wisniewski, left, celebrates his goal with teammate Jim Vandermeer during the Blackhawks' 5-2 win over the Blue Jackets. Just like that, the Chicago Blackhawks turned a deficit into a scoring spree. In the process, they handed the Columbus Blue Jackets their first regulation loss in more than two weeks. Chicago (8-7-0) seemed to be in good shape after two periods, as James Wisniewski had the game’s only goal through 40 minutes of play, which came at the 8:29 mark of the second period. But the Blue Jackets fought back early in the third period, using goals from Rostislav Klesla and Nikolai Zherdev that came just 1:25 apart. That forced some of Chicago’s young guns to take over. Toews scored the first of the Blackhawks’ three quick tallies, but it was Seabrook and Duncan – both defensemen – who tied and gave Chicago the lead, respectively. Wisniewski, Seabrook and Keith all beat Columbus goalie Fredrik Norrena from close range, as Savard has been preaching to his blueliners to contribute more offensively. Keith made it 4-2 from the left side of the crease with the teams skating four aside. Patrick Sharp made it a three-goal game with just 11.2 seconds remaining. He was credited with a tally after Blue Jackets left wing Jason Chimera knocked the net off its moorings after Sharp’s empty-net chance hit the post. Toews added an assist on Seabrook’s goal for his first multi-point game in the NHL. Patrick Lalime made 24 saves for the Blackhawks, who host the St. Louis Blues on Friday night. Joffrey Lupul and Jeff Carter set the tone early by scoring on two of Philadelphia’s first three shots, leading the Flyers past Pittsburgh at Mellon Arena for their first win there since Jan. 21, 2006. The lone bright spot for the struggling Penguins – who’ve dropped five of their last seven games -- was Sidney Crosby, as the captain extended his points streak to 14 consecutive games with an assist on Ryan Malone’s goal in the first period. ''We hit a couple of posts, we had our opportunities but it's hard to fall behind like that and get back into it,'' Crosby said. The Flyers went 0-8 against the Penguins last season, giving up five or more goals in five of those contests. Obviously, Wednesday night provided a nice change of pace for a team that experienced several changes during the offseason. Lupul gave Philadelphia the lead just 28 seconds into the contest, when he took a pass from Danny Briere and fired a wrist shot past Dany Sabourin – who got the start despite Marc-Andre Fleury’s 8-0 record against the Flyers last season. Philadelphia quickly built on its lead when Carter scored his seventh goal of the season at the 5:33 mark of the first. After some tremendous forechecking by Scottie Upshall, Carter got to the front of the net and roofed Upshall’s feed past Sabourin to make it 2-0. Crosby helped the Penguins get back into it when he found Malone standing alone at the side of the net with under a minute remaining in the opening period, but the Penguins wouldn’t get any closer. Mike Richards rounded out the scoring with his ninth goal of the season at the 8:46 mark of the second period. He was able to capitalize on a 2-on-1 with Smith, as he beat Sabourin with a quick wrist shot to make it 3-1. All three of Philadelphia’s goals came against the line of Crosby, Malone and Evgeni Malkin. The Penguins went 0-for-7 on the power play, while Flyers goalie Martin Biron improved to 8-4 on the season in a 26-save effort. Pittsburgh had scored at least once on the power play in each of its first 14 games. Despite a plethora of injuries, Lindy Ruff’s squad found a way to get it done. Clarke MacArthur – recalled by AHL Rochester on Tuesday – scored his first goal of the season at the 3:16 mark of overtime, as Buffalo won for only the third time in its last nine games. 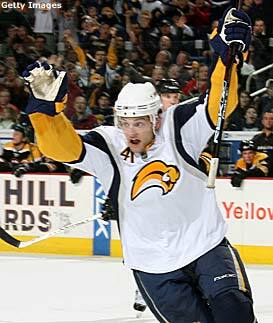 Clarke MacArthur of the Buffalo Sabres celebrates his game-winning goal in overtime to defeat the Bruins 2-1. Indeed it was a relief for the Sabres, who were forced to play Boston without five regulars, including Tim Connolly (strained abdomen) and Adam Mair (sprained right ankle). But MacArthur – who was leading the AHL with 18 points prior to his promotion -- was more than willing to lend a hand. After moving into the high slot, MacArthur took one-timed a feed from Drew Stafford past Bruins goalie Tim Thomas, who finished with 27 saves. The goal snapped a three-game losing streak for Buffalo. ''I got a decent look at it, but it knuckle-curved on me,'' Thomas said of MacArthur's tally. Boston took a 1-0 lead when Marc Savard potted his third goal of the season at the 8:07 mark of the opening period. The Bruins’ forward was able to slam home a loose rebound after Sabres goalie Ryan Miller made an initial save on Glen Murray. But the Bruins failed to get another shot past Miller, who finished with 25 saves to help his team notched the win it was desperately seeking. “It’s a good step forward,” Miller said. The Sabres erased the 1-0 deficit with 4:10 to play in the second period, when Ales Kotalik scored on the power play. With Zdeno Chara in the box serving an interference penalty, Kotalik took a pass from Maxim Afinogenov and fired a slap shot from the left point past Thomas to make it 1-1. It was his third goal of the season. For Tampa Bay, there really is no place like home. Martin St. Louis and Jan Hlavac scored in the first period, and Johan Holmqvist finished with 22 saves as the Lightning improved to 6-1-1 on home ice with a win over Florida at the St. Pete Times Forum. Tampa Bay, which is 0-7-0 on the road, snapped a six-game losing streak and won for just the third time in 12 games after starting the season with three straight victories. "We haven't forgotten what our identity is and what we think we can do as a club. We can't," Tampa Bay coach John Tortorella said. "If you start second-guessing all that because of a losing streak, then it's gonna be a long year. So you have to try to keep yourself straightened out mentally about how good we can be." Hlavac gave his team an early lead with his second goal of the season just 1:48 into the contest. Less than five minutes later, St. Louis beat Panthers goalie Tomas Vokoun for a lead that Holmqvist preserved the rest of the way. Kamil Kreps scored the lone goal for Florida, which did its best to stay in it by killing off six Lightning power plays through the first two periods. But Holmqvist made Tampa Bay’s lead stand. "We gave them two goals right off the bat. Some turnovers, and the puck's in your net," Panthers coach Jacques Martin said. "Against a team like that, you can't give them easy goals. You've got to make them earn those goals." Meanwhile, St. Louis remains confident that the Lightning will get things going on the road, which they’ll have to do in order to contend with teams like the Carolina Hurricanes in the Southeast Division. With five days in between games, Detroit needed some time to shake off some rust. When the Red Wings finally did, they came away with their eighth straight win. 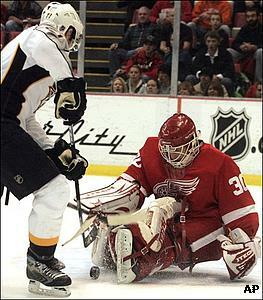 Nashville's J.P. Dumont misses a shot on goal against Detroit's Chris Osgood. After surrendering a late 2-0 lead, Pavel Datsyuk and Henrik Zetterberg scored in the shootout against Chris Mason (43 saves), while Chris Osgood stopped both Alexander Radulov and J.P. Dumont as Detroit came away with the victory at Joe Louis Arena. The Red Wings took a two-goal lead into the third period thanks to goals from Daniel Cleary and Jiri Hudler, but Detroit lost its way late in regulation. Ryan Suter cut the deficit in half with 7:32 remaining when he one-timed a shot past Osgood, and Dumont tied the game with just 1:24 left, as he was able to stuff a loose puck past the Red Wings’ netminder near the left post to make it 2-2. "After five days off, I thought we'd struggle early and the first half we were great, skating good." said Osgood, who finished with 28 saves. "The second half, we didn't have our legs, weren't skating, and they came at us pretty hard." Zetterberg picked up an assist on Hudler’s tally and has notched at least a point in each of Detroit’s first 15 games this season, setting a new franchise record. Norm Ullman had a 14-game point streak to start the 1960-61 season. “It's fun to break records," Zetterberg said. "Easier to do it when you're winning and playing with good players." That being said, Zetterberg was not happy that his team nearly let two points slip away. The Red Wings held a 30-14 edge in shots after two periods. “We shouldn't have let them get those two goals," he said. Wojtek Wolski and Marek Svatos scored in the shootout, giving Colorado a thrilling over Edmonton at the Pepsi Center in a game featuring two teams headed in opposite directions. Dwayne Roloson made 35 saves for the Oilers, who have lost their last four games. Meanwhile, Colorado – which received a 30-save effort from Peter Budaj – has won six of its last seven. Budaj also stopped all three chances in the shootout. Edmonton, which had been blanked in the opening period of its last three games, scored three times in the first on Wednesday with goals from Kyle Brodziak, Tom Gilbert and Ales Hemsky. The Oilers held a 3-2 lead after the first, as Ian Laperriere and Tyler Arnason beat Roloson in the opening 20 minutes. Laperriere tied the game with his second tally of the night at the 2:20 mark of the third period. It was his first two-goal night since March 21 of this year, which was also against the Oilers. Ryan Smyth played his second game against his former team, recording three shots on goal in 20:32 of ice time. But it was Laperriere who provided a large chunk of the offense in this one for Colorado, which improved to 8-1 on home ice this season, tying it with Ottawa for the best home record in the NHL. Edmonton forward Jarret Stoll was pleased with the effort Edmonton (5-10-1) gave, especially after Monday night’s 5-2 loss to the Minnesota Wild. Shane Doan made Peter Mueller’s first professional hat trick worthwhile, as the Phoenix captain scored with 30.3 seconds left in the extra session to give his team a victory over a struggling Anaheim squad at the Honda Center. The Coyotes (6-7-0) continue to roll right along on the road, as they won their fifth straight away from Jobing.com Arena. Steven Reinprecht chipped in for Phoenix with a goal and two assists. Shane Doan, center, gets a hug from Zbynek Michalek and Keith Ballard after scoring the game-winning goal against the Anaheim Ducks. For the second straight game, Ducks coach Randy Carlyle pulled his starting goaltender, as Ilya Bryzgalov was taken out of the game at the 17:11 mark of the second period after allowing four goals on 18 shots. Jean-Sebastien Giguere, who replaced Bryzgalov, was pulled after giving up four goals on 19 shots in Sunday’s 5-0 loss to the Dallas Stars. The move seemed to ignite a spark, as the Ducks erased a 4-2 deficit on goals from Mathieu Schneider and Drew Miller, who tied it 1:38 into the third period. Muller completed the hat trick less than three minutes later, but Anaheim quickly struck back again when Corey Perry scored at the 5:38 mark to make it 5-5. Doan was able to capitalize late in overtime, when Perry collided with teammate Francois Beauchemin near the left boards. The Coyotes’ captain gained control of the loose puck and stuffed it past a surprised Giguere for his 36th career game-winning tally. The Ducks, who dropped to 6-8-3 on the season, host the San Jose Sharks on Friday night. "It was one of those games where it seemed the last shot was going to win," Carlyle said. "They got the last shot and we made a mistake in turning over the puck in overtime. If you score five goals, you should win the hockey game. The positive point is we got our power play going and we created some offense. We came from behind and we didn’t quit. We had the emotional level. We were able to reach back for the third period and get ourselves into it."